Soul Story Time-Life - TimeLife Music Presents a CD Collection Set of Classic Soul Artists. As Seen On TV with Jerry Butler and Gayle Samuels. 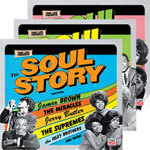 Relive the music that changed the world and acted as a respite for millions of Americans for three decades with the Time Life® Soul Story CD set; a complete collection of the music of the best soul artists of all time. Remember, relive, and relax to tunes by the likes of Aretha Franklin, Otis Redding, The Temptations, Jerry Butler, Gayle Samuels and the Godfather himself, James Brown - plus many, many more. "Some are more than just entertainers," soul legend Jerry Butler says. "Some inspired us; some made the world a better place." Now you can listen to Marvin Gaye, The Supremes, and Ray Charles right in your own home - on your CD player. This great Time Life edition combines all the legendary artists, all the hits, all in one inspiring set that no song collection is complete without. "From Sam Cook in the 50s to Al Green in the 70s, what a beautiful and soulful trip we've been on," says Gayle Samuels. And it's all right here in the TimeLife Soul Story collection - you'd waste thousands of dollars and hundreds of hours trying to get all the great hits contained in the volumes of The Soul Story from Time Life Music. Soul Story includes 10 CDs packed with over 150 soul-inspiring hits! Order now and you'll also get a 2 free bonus CDs: Hard to Find Hits - two fascinating albums of soul songs you'll never hear on the radio again. Use the links below to find the best deal on Time Life® Soul Story.